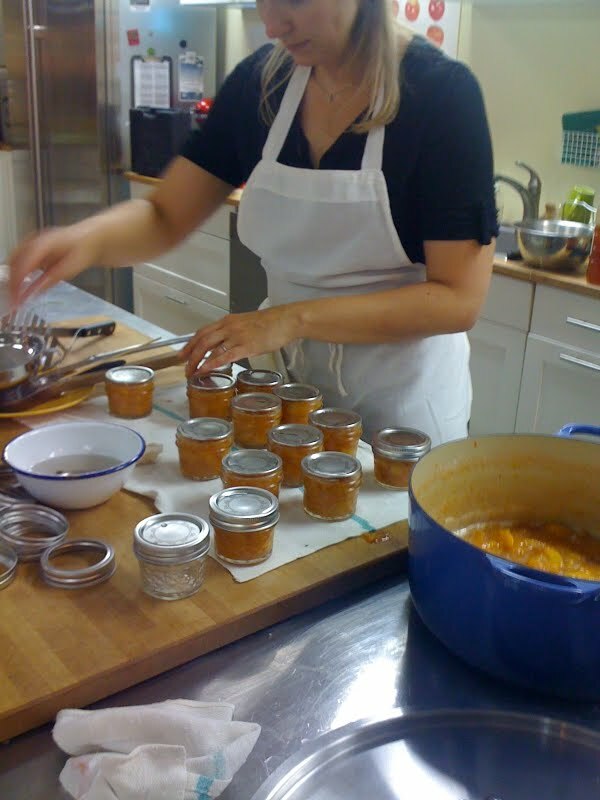 So the other night I took a class on preserving the seasonal harvest at The Brooklyn Kitchen with Sheri Brooks Vinton. The class was a great into into preserving using the boiling water method. 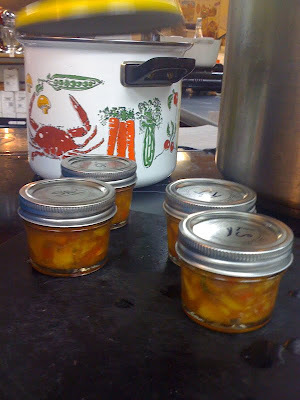 In the class, Sheri did a demo preparing and preserving peach ginger jam from her cookbook, Put 'em Up , while in the class we made and preserved peach salsa - so good! 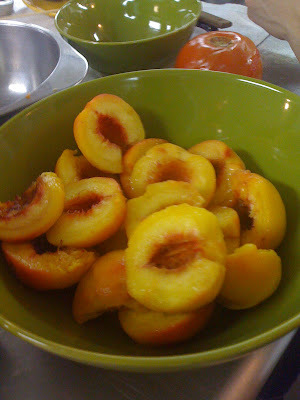 I love peaches so this was a fun class, and by the end my head was about to explode with instructions and tons of useful tips about preserving at home. I left purchasing a copy of Put 'em Up, which looks to be a great book with tons of recipes perfect for at home preserving. I especially like how the book is organized, with separate sections for different fruits and vegetables. Now, its not like we eat jam by the boatload or anything around here, but I am eager to try out my at home preserving. I don't do any gardening so I plan to go to the farmer's market shortly today and pick up tons of fresh blueberries to make the blueberry quick jam recipe in Sheri Brooks Vinton's cookbook. 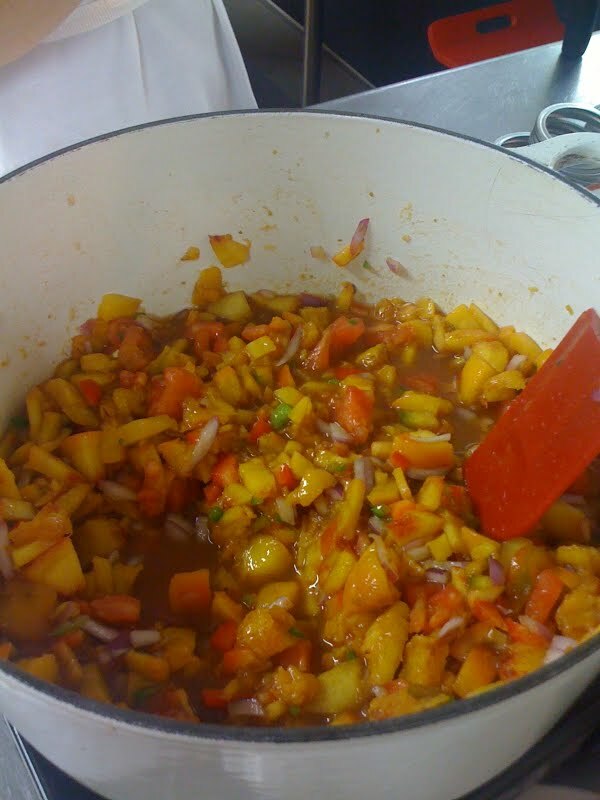 Included are some pictures from the class of the canning process, and also of the delicious peach salsa that we made and preserved in the class. This was such a fun and informative class, and I can't wait to get started preserving at home. It seems like a terrific way to make gifts for friends and family as well, once I get the hang of what I am doing with the preserving process. I just hope that the large pots I use are big enough since I don't have the ginormous pot that we used in the class for preserving. I'll make do, I suppose. Blueberry jam, here I come! I look forward to putting the new skills I learned to use later today.